A great way to introduce children to classical music. 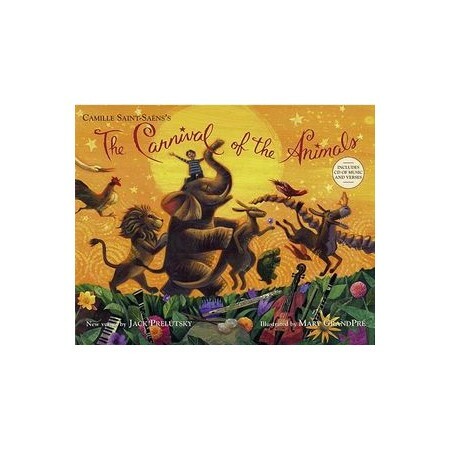 America's first Children's Poet Laureate has written all-new verses to accompany the composer Camille Saint-Saens's "The Carnival of the Animals, " and the illustrator of the Harry Potter books has turned these rollicking rhymes into a picture-book fun fest. Includes a CD of the music and of Jack Prelutsky reading the verses. A note to parents and teachers by Judith Bachleitner, head of the music department at the prestigious Rudolf Steiner School in New York City, suggests ways preschoolers can act out the music, tromp like an elephant, hop like a kangaroo, glide like a swan or for older children, be creatively inspired by this joyful work.